Ismail swims at the Olympic Pool in Sarajevo. Ismail Zulfic breaks taboos on a daily basis. The 8-year-old from Zenica, Bosnia-Herzegovina, was born without arms and with deformities of both feet, but he's cheerfully made a place for himself at school, on his swim team, and in his community. Ismail is growing up in a society where differences are not accepted easily -- but it's the existence of prejudice that Ismail and his family refuse to accept. Ismail during the training at the Olympic Pool in Sarajevo. 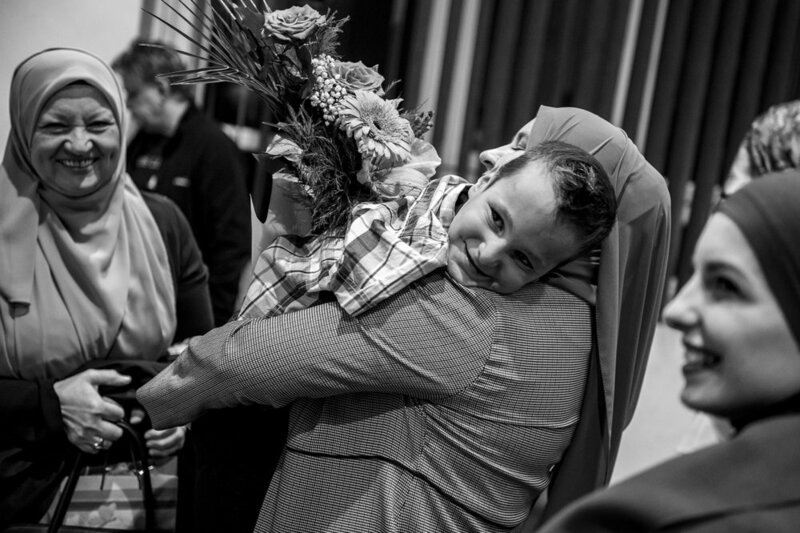 His family is like many others in Bosnia: his father, Ismet, works, while his mother, Elmina, stays home to take care of the children. Elmina has taught Ismail how to handle the curiosity of other kids, who sometimes ask hurtful questions, like "Where are your hands?" With the help and persistence of his parents, new worlds have opened up for Ismail. Three years ago, he was afraid of water, but just one year of training turned him into a fearless swimmer and the regional champion at a competition in Croatia. Since then, he's gone on to win more medals, along with the admiration of friends and relatives. "His smile is priceless. I watch him laugh while he swims the backstroke. He does it unconsciously," his father says. "And as long it makes him feel that way, we will support him. He is strong enough for all of us. He never needs to sleep." Mother Elmina and Ismail after a day in school. Parents say how the hardest thing was when Ismail asked them to give him their hands, so he could hug them. Ismail's parents approached kindergartens in Zenica to find a spot for their young son, only to be turned down by a number of schools. Their experience was not unusual: families are often left to support their children with disabilities without much help from institutions. But teachers at a preschool called Sindibad made an extra effort to accept Ismail and to encourage his classmates to welcome him. Before the new student's arrival, educator Nisveta Kozlic wrote a story about a butterfly without wings and shared it with her students. "The goal of the butterfly story was to bring the concept of someone's physical disability to the children," Kozlic says. "I encouraged the children through the story, first of all, to love the butterfly by pointing out his positive qualities: nobility, kindness, generosity, intelligence, speed. And at the very end, I mentioned the lack of wings. "At first, there was one frightened Ismail and an even more frightened teacher, and my fears were fueled by the question, 'What if I handle this wrong?' But when you have an encouraging environment and a real team, everything is much easier." Elmina shows one of the drawings that Ismail got from a friend at school. Teachers laid out their plans to meet Ismail's specific needs at school, including in his social development. "Once a week, we all took off our socks and did something with our feet, mouths, or other parts of our bodies, like painting or drawing," Kozlic says. "In these activities, the boy was superior to his friends, and the same activities contributed to developing a positive image of himself. And his friends could better understand the kind of problems he faces on a daily basis. "The boy also had the daily support of his classmates. Every day he had an assistant who helped him do what he couldn't do independently -- take off his jacket, zip his jacket, and so on. This creates a sense of responsibility for the children, but it also makes it easier for me to work." Ismail swims across the entire Olympic Pool. In November 2015, swimming coach Amel Kapo founded a club called "Spid" in Sarajevo to provide opportunities for children with disabilities. The club is free for members and relies on grants from foreign donors. "Since I spend a lot of time at the pool, I noticed that a number of disabled people come to the Olympic pool to swim, but unfortunately none of the professional staff work with them," Kapo says. "So I came up with the idea to set up a swimming club for people with disabilities. This is the first club of its kind in Bosnia-Herzegovina, and it's unique. These people will never say that they can't do anything. It's only society that sees obstacles." Ismail chats with a friend in the pool. Ismail takes off swimming goggles. Ismail plays with other children from the swimming club after the training in the pool. Children go to the dressing room after one-hour of training at the Olympic Pool in Sarajevo. At Ismail's first training session, it took him an hour before he agreed to get in the water. After two hours, he didn't want to leave the pool. His father used to drive him 70 kilometers to Sarajevo for training each week, but after the coach pointed out his potential, people in the community volunteered to help out. "When I first brought Ismail to the pool, people looked at us strangely, with a lot of prejudice. We've changed that," Kapo says. "Now they look at us as champions." Members of the Spid swim club stand for the national anthem during an international competition. Ismail gives to coach Admir a piece of cake he got for his birthday from the members of the Spid swim club. Ismail celebrates his birthday with coach Amel and other member from the swimming club Spid. Ismail's parents worried that elementary schools would refuse to admit him, as several kindergartens had done. So they enrolled him a private school, with the assistance of a scholarship. Ismail is doing the task he got from a teacher during class in elementary school Hasan Kjafija Pruscak in Zenica. "We don't ask them to make (schoolwork) easier for him. He goes to the same classes as everyone else. This society needs people who will work with children like him. We don't have many of them," his mother says. "Socialization is very important. He's an example of how every child, regardless of their limitations, can be successful in something, and this needs to be recognized early on. In this case, Ismail is guiding our society and providing [others] an opportunity to develop. On the other hand, this motivates other parents not to retreat, and to involve atypical children in various activities. We are proud that he represents our school." Ismail during school break drinks water, friends from the class assist Ismail when he needs it. A friend from a class shares her colored pencils with Ismail. Elmina and Ismail after the school day in front of the elementary school Hasan Kjafija Pruscak in Zenica. Ismail's swimming coach is also a skiing instructor, and he introduced his student to the sport. He took to it immediately. "No matter how cold it is, it's never enough for him," Ismail's father says. Coach Amel and Ismail talk in the vehicle during the trip to the Olympic mountain Bjelasnica which is about 100 kilometers away from Zenica. During winter they also train skiing. Elmina gives Ismail a cough syrup before it gets on the skis. 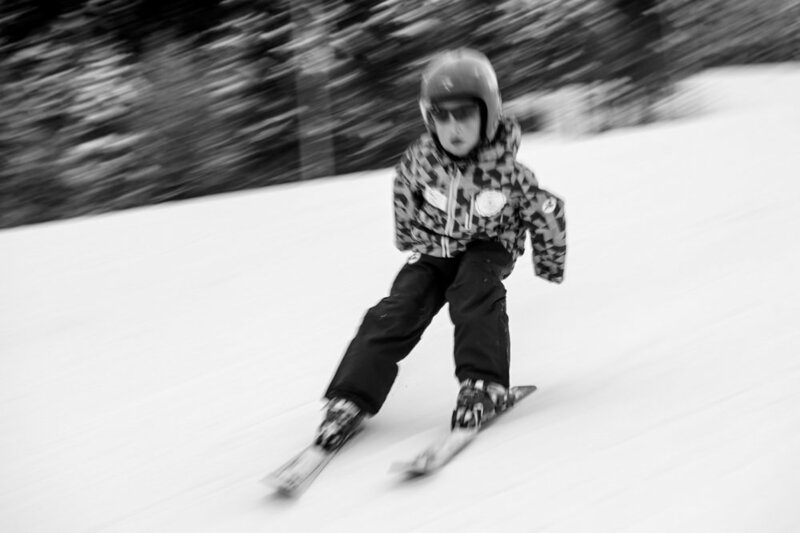 A small cold did not discourage him from skiing at the Olympic mountain Bjelasnica. Ismail is skiing at the Olympic mountain Bjelasnica. Ismail is impatiently waiting for the coach to ski together at the Olympic mountain Bjelasnica. Ismail with parents and coach after skiing at the Olympic mountain Bjelasnica. Ismail learned to ride a bike with training wheels, which his parents were reluctant to remove. His mother noticed that he was spending a lot of time playing at his friend Osman's house. "I decided to find out what they were doing, and I saw him riding a bike without training wheels," Elmina says. "He looked at me with a smile and said, 'This is why I went to Osman's.' Soon after that, I found him in the garage trying to take the training wheels off his own bike. His will and desire were stronger than our fear, so we decided to let him do it." 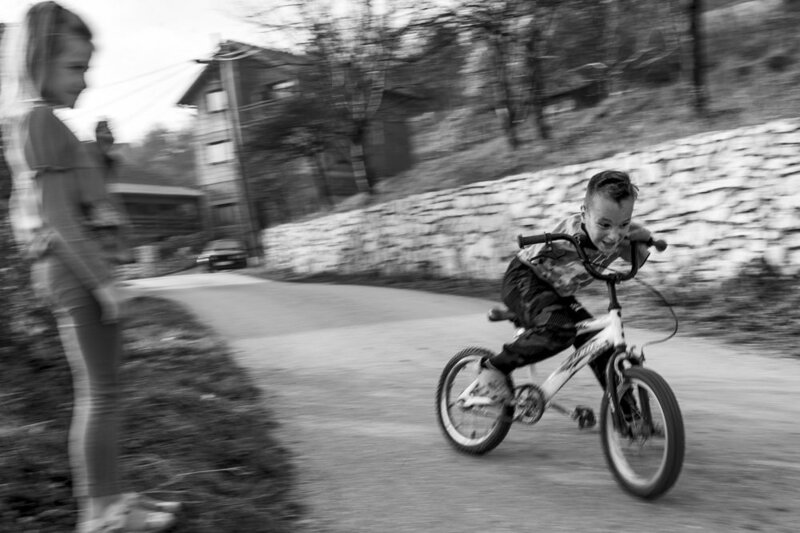 Ismail shows his sister how to drift on a bicycle on the road next to their house in Zenica. Ismail pushes a bicycle to the road while his sister makes the towers in the sand. Ismail's father taught him how to ride a hoverboard, or self-balancing scooter, which helped him improve his balance for skiing. Ismail shows how skillfully he drives a hoverboard in his home in Zenica. Ismail's teacher, Nisveta Kozlic, decided to publish her story about the butterfly as a book in order to share its message with a wider audience. "A boy came into my life, Ismail Zulfic, and he brought immense wealth and memories of a lifetime," she says. "He brought many good people with him. I would say he brought together those whose philosophy of life is similar. One little, fragile being who needed others woke up my hidden potential." The launch of Kozlic's book was an emotional moment for Ismail's parents. Ismail plays with friends at the book launch. "Ismail's story is a heroic form of struggle," psychologist Edin Dzanko says. "Unfortunately, this struggle is dependent on the commitment of the family and (other) individuals." Ismail's parents, teachers, and coaches have all helped him get the most out of school and playtime, but there are many other kids who receive little or no such support. Only a fraction of children with disabilities receives special assistance at school and in their home life. "A study done in 2015 shows that in Bosnia-Herzegovina, 23 percent of children have some form of atypical development, which means that every fourth child does not develop typically in at least one area. If money is not invested in education at the earliest age, with time it becomes more and more expensive," Dzanko says. "If the state invests 1 million marks (500,000 euros) in that 23 percent of children, it will save millions over the next 10 years." Ismail gets high-five from his coach during the training at the Olympic Pool. In Ismail's community, the efforts made to include him and help him thrive have yielded great rewards -- not only for one 8-year-old, but also for those around him.